A condenser is the part of your air conditioning system that sits outside. The space around the condenser must be clear of debris to allow air to circulate freely. Too much foliage around the condenser can greatly affect the efficiency and could also cause the condenser to stop working. Shrubs planted near the condenser don’t only inhibit the air flow but can also shed leaves, twigs and other materials into the unit. Make sure to always plant at least 3 feet away from your air conditioning condenser to help with ventilation. It’s also important to avoid placing anything on top of the condenser. The unit vibrates and can cause whatever is placed on top of it to fall off or worse, fall into the condenser. Objects on top of the condenser also block the fan. 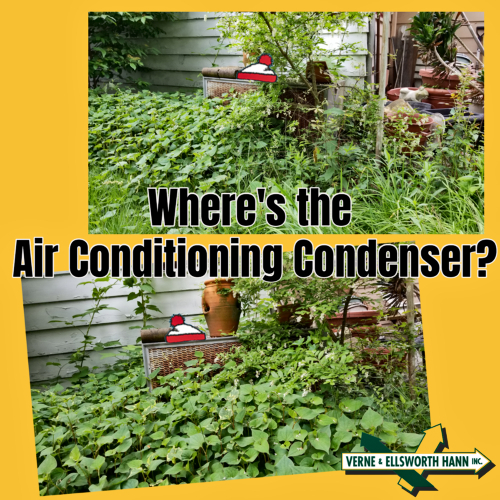 Chances are, if you can’t see or find your condenser…you really need to cut your shrubbery back and remove anything you may have sitting on top of it! Here at Verne & Ellsworth Hann, we see this a lot. Taking the time to trim anything that’s overgrown around your A/C condenser can make for avoidable repairs or even a total replacement.